The StaminaFibre 3 Day Bedding Warehouse Sale takes place at 310 Watline Avenue, Mississauga, ON. The closest intersection is Hurontario and Highway 401. This sale starts Thursday May 25 and runs through May 27, 2017. 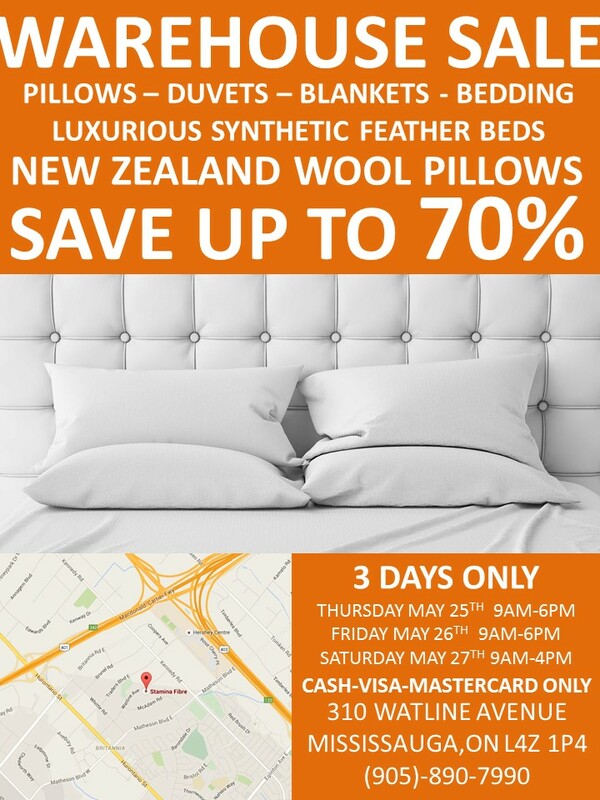 Click here for more information on the StaminaFibre Bedding Warehouse Sale. 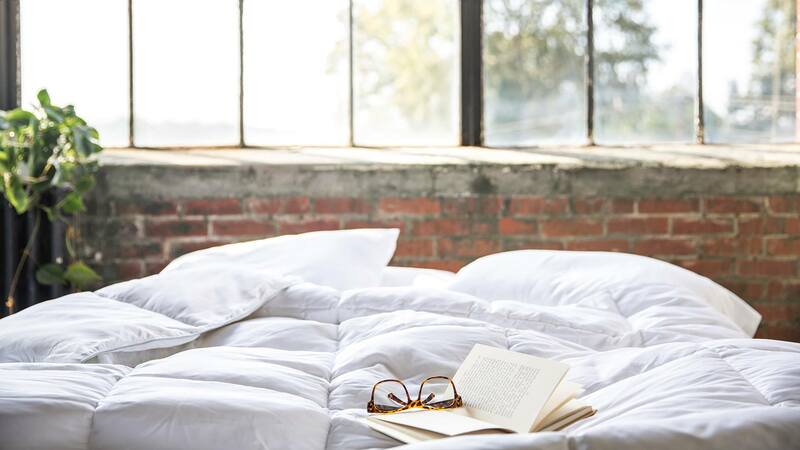 StaminaFibre Canada Bedding Warehouse Sale Fall/Winter 2016: Save Up to 70% Off Pillows, Duvets, Memory Foam Mattresses & More! StaminaFibre Canada is having their biggest Bedding Warehouse Sale ever! The sale starts on Thursday October 13th, 2016 and runs for just 3 days! You will not want to miss this unique opportunity to save as much as 90% off retail on luxurious pillows, duvets, memory foam mattresses, body pillows, throw cushions, pet beds, sheet sets, Marriott Hotel Towels / Bath Robes and much more. The StaminaFibre 3-day bedding warehouse sale takes place at 310 Watline Avenue, Mississauga, ON. The closest intersection is Hurontario and Highway 401. This sale starts October 13 and runs through October 15, 2016. 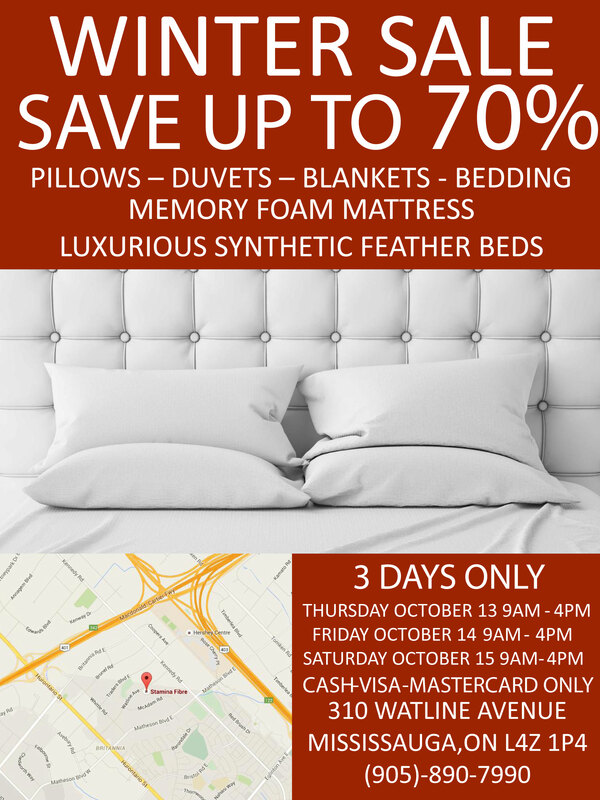 Click here for more information on the StaminaFibre’s Bedding Warehouse Sale. NCIX Canada Warehouse Event is the place to go if you’re looking to get new tech accessories or update your computer, home audio, and more. Receive up to 80% off tech from trusted brands like Panasonic, Microsoft, Samsung and more. 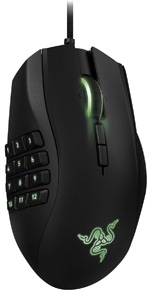 Save $39.98 on this Razer Naga Wired MMO Mouse, regularly priced $119.98 but now just $80. 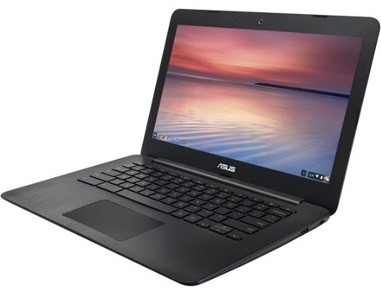 Or get this ASUS 16 GB, 11.8 Inch HD Chrome OS ASUS Chromebook Laptop, originally $321.98 but now $279.99 – that’s a savings of $42. All clearance items are selling quickly so don’t hesitate to take advantage of these great deals. Receive FREE SHIPPING on any Clearance Centre orders over $50 and under 50lbs when you use the COUPON CODE: NOWORNEVER. Click here to shop at NCIX Canada. 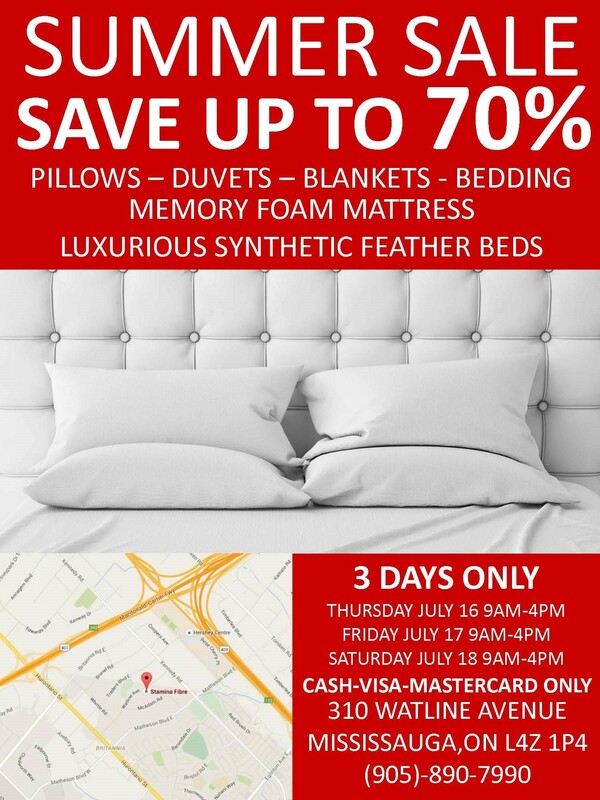 StaminaFibre Canada is having their biggest Bedding Warehouse Sale ever! The sale starts on Thursday March 31st 2016 and runs for just 3 days. You will not want to miss this unique opportunity to save as much as 90% off retail price on luxurious pillows, duvets, memory foam mattresses, body pillows, throw cushions, pet beds, sheet sets etc. The StaminaFibre 3 Day Bedding Warehouse Sale takes place at 310 Watline Avenue, Mississauga, ON. The closest intersection is Hurontario and Highway 401. This sale starts on March 31st and runs through April 2nd, 2016. Pierre Belvedere Canada Warehouse Sale: Save Up To 85% on Stationary, Toys & More! 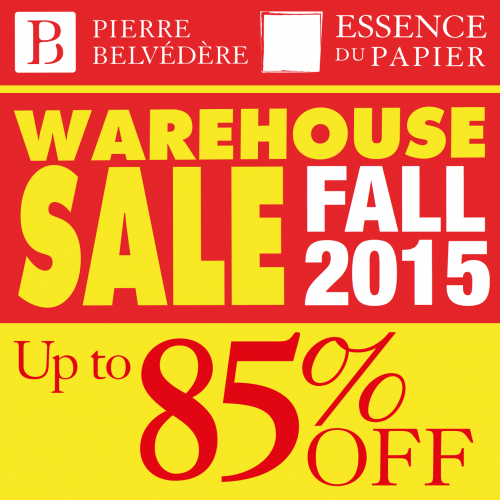 You won’t want to miss Pierre Belvedere’s fall 2015 warehouse sale! Thousands of toys and fine stationery items will be available below cost at great discounted prices. 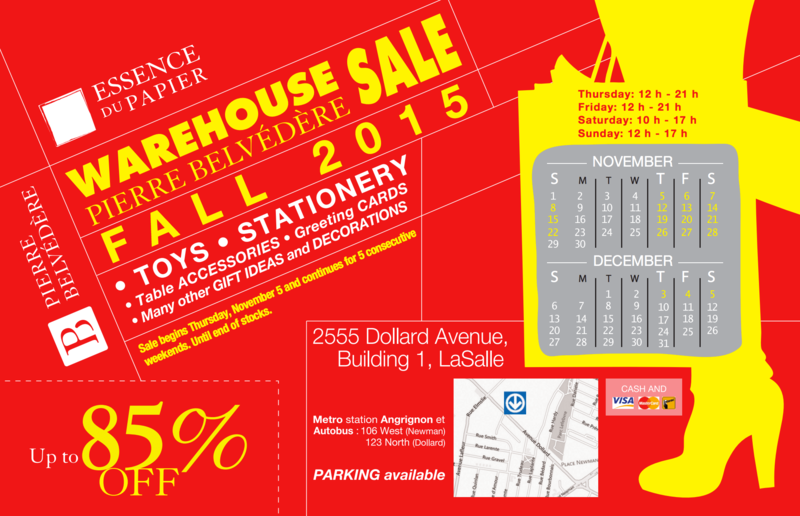 Shop at Pierre Belvedere’s warehouse sale and you will get up to 85% discount on gift ideas for the whole family. New products will be added every day! Visit Pierre Belvedere’s sale starting Thursday, November 5 at 12:00 noon. The sales finish on Saturday, December 5, 2015 (or until out of stock). Check the schedule below for more details. This warehouse sale is taking place at 2555 Dollard Avenue, Building 1, LaSalle, Quebec. Toys: Ravensburger / Clementoni / ThinkFun / Smart Games / Trefl / Androni and many more major brands. Click here for more information on Pierre Belvedere’s warehouse sale! If you’re looking for some new casual or workout clothes, you won’t want to miss this hot deal from Lululemon Canada! 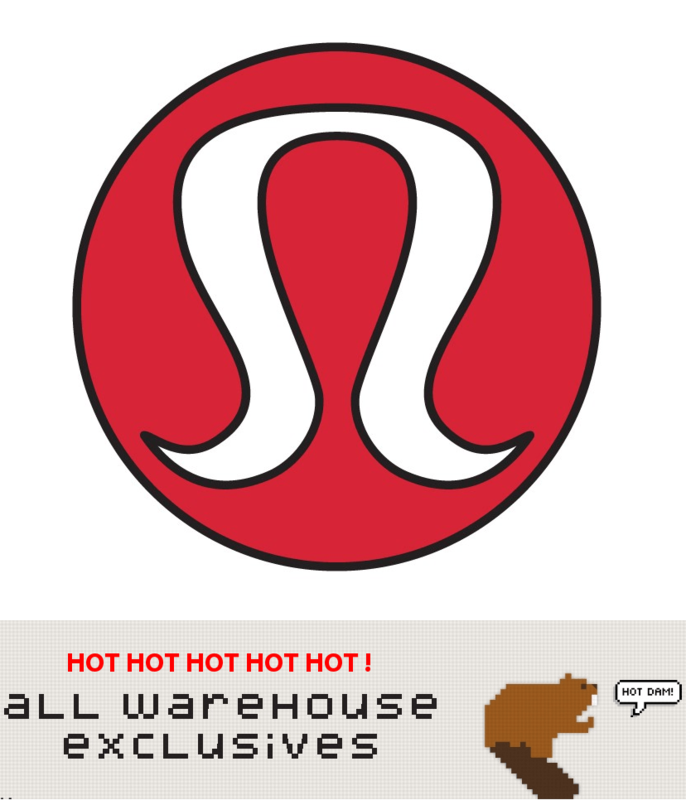 Head online now and you could shop Lululemon’s Warehouse Sale! During this sale you can find some hot deals on gear for up to 75% off! Women can find some hot deals on items like this Snapshot Crew. Originally sold for $128, you can purchase it now for just $39! This stretchy crewneck is designed to keep you cozy on chilly days. Made with Polartec Power Stretch Pro fleece, this crew is super soft and will keep you warm as you travel outside post workout. It’s also so soft and comfortable that it will make a great item to lounge around in at home on cooler days. There are less deals available for men, but you can still find a some great items like this Six Pack Jacket. Originally sold for $128, you can purchase it online now for only $59. 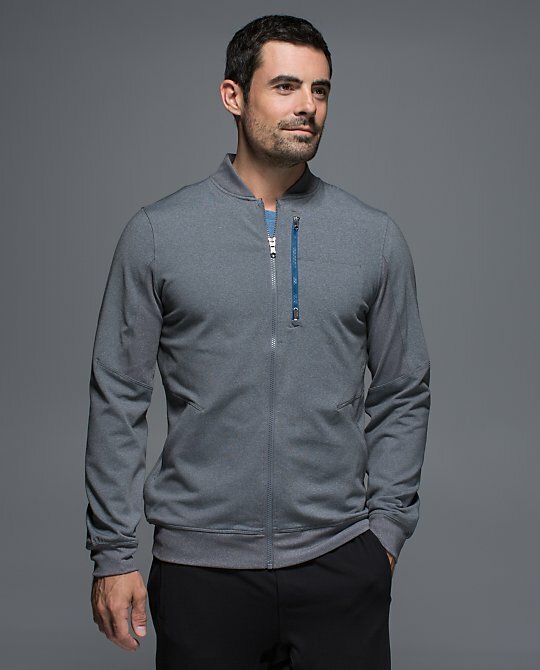 This jacket was designed to wear post workout, so it features sweat-wicking technology along with a comfortable four way stretch fabric that will move with you. It not only makes a great post workout jacket, but you can throw it on over a tee and jeans for a cool and casual style. These offers are on for a limited time only, while supplies last. Stock is selling out quickly, so you may not want to wait! There’s a limit of 25 items during this sale and you cannot purchase more than 5 of a single item. All of these items are final sale! If stock doesn’t sell out early, it’s also possible that prices may drop even more as the sale goes on, so keep checking back. Lululemon offers free shipping on all orders. Click here to begin shopping Lululemon’s online Warehouse Sale. There’s a great summer warehouse sale on StaminaFibre Canada! Save up to 70% on pillows, duvets, blankets, bedding, memory foam mattresses and more! Canada Day may have already passed, but Lug Canada is still celebrating online. Head over to Lug and you could save up to 50% off clearance styles such as hats, bags and more. Not only that, but in honour of Canada Day, you can take another 15% off Go Canada Gear using the promo code GOCANADA2015! It’s a great idea if you want to show your Canadian pride while cheering on Canada at the Pan Am games, or if you’re travelling and want to let everyone know where you’re from! 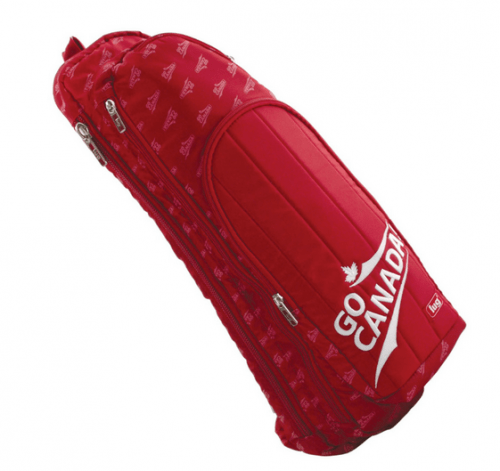 This Lug Go Canada Glider is great for carrying all your essentials around town. It originally sold for $70.99, but you can find it on clearance now for $35.50. Take another 15% off with today’s promo code and you could get this glider for $30.17. This shoulder sling bag has an easy access cell phone holder at the top, hidden water bottle holder, and multiple interior cargo pockets. And with the zip pocket on back of bag to keep valuables close to body, you can carry just about everything you need with you all day long! 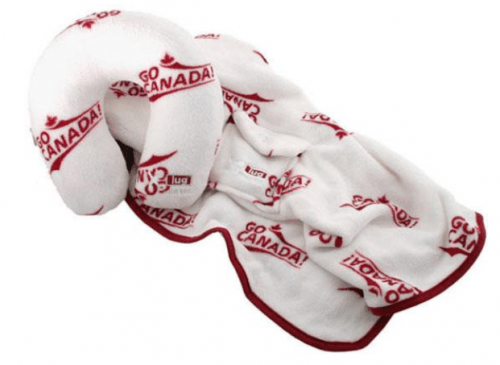 If you’re travelling, pick up the Go Canada Snuz Sac Blanket and Pillow from Lug. Originally sold for $31.99, you can find it on clearance now for $15.99. Take an additional 15% off with today’s promo code and you could get this great travel essential for only $13.59. Inside the U-shaped case, you’ve got a cozy blanket to keep you warm, and just inflate the case for a U-shaped pillow that will help keep your neck well supported during travelling. This is a great item to have on hand when you need to travel by plane as it won’t take up much space in your carry-on and it will keep you warm and comfortable on long chilly plane rides! This deal is on for a limited time only. Enter the code GOCANADA2015 at checkout. The additional 15% off will only be taken from Go Canada Gear.Lug Canada charges shipping fees differently depending on your location. Click here to shop deals online at Lug Canada. 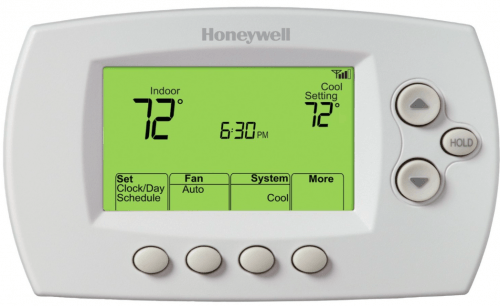 The Honeywell Wi-Fi Programmable Thermostat is an excellent addition to your home, especially if you’ve been trying to save on energy costs, as it will alert you as to whether your home is too cold or too warm and will also give you a precise temperature reading. While doing a price comparison on the Honeywell Thermostat, I found that the same model usually sells for well over $100. For instance, on Amazon.ca they were selling this same model for $193.56. Click here to find the nearest retail Costco location to you. 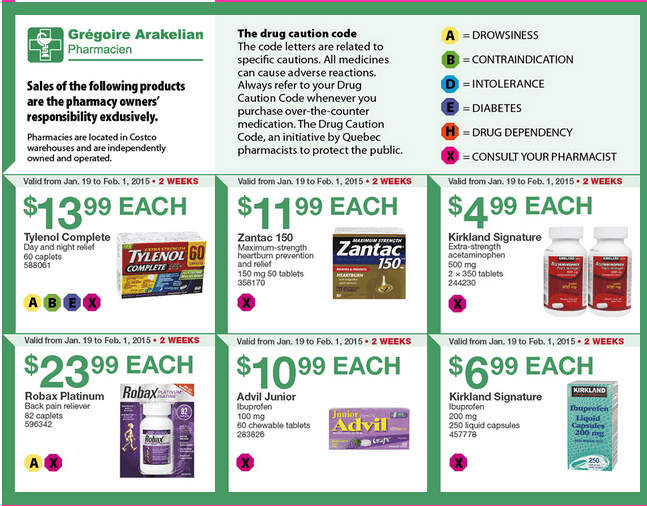 Costco Canada has released the new Quebec weekly instant discount handouts! These handouts are available at all Costco wholesale warehouses in Quebec province. These Costco Canada eastern instant flyers are valid from today, Monday, January 26 until Sunday, February 1, 2015, some are valid until Sunday, February 8, 2015. Only Costco members in good standing may use these instant savings handouts and Costco discount will be automatically added when you purchase any of these items. $4 OFF Molinaro’s Deluxe pizza. 3 × 563 g. Price before discount: $14.89. $4 OFF Cardinal Roadhouse Pork back ribs. 908 g. Price before discount: $13.99. 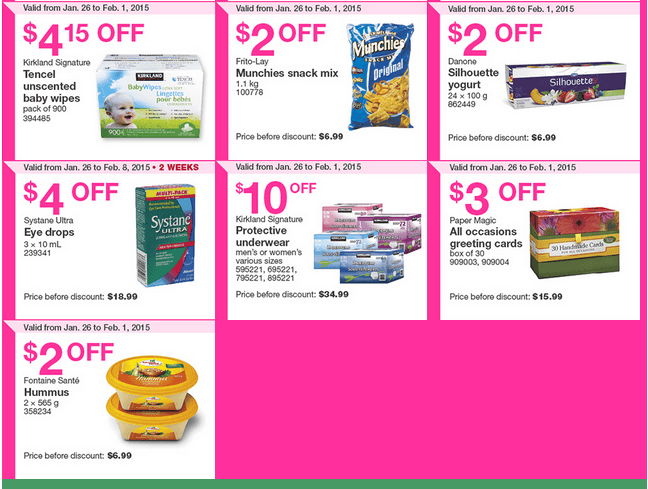 $9 OFF FoodSaver Vacuum rolls and bag assortment. Price before discount Warehouse: $39.99. Costco.ca: $44.99 (delivered). $12 OFF Cold-FX Extra strength immunity boost. 150 + 18 capsules. Price before coupon: $58.99. $2 OFF G.H. Cretors Chicago mix popped corn. 737 g.
$3 OFF Mars Peanut M&M’s. 1.58 kg. $4 OFF Balderson Extra-old cheddar. 1 kg. Price before discount: $14.99. $35 OFF FoodSaver Vacuum system. Price before discount Warehouse: $159.99. Costco.ca: $164.99 (delivered). $2 OFF Tostitos Salsa. 2 × 1.21 L. Price before discount: $8.99. $350 OFF El Monterey Chicken taquitos. pack of 40. Price before discount: $13.49. $320 OFF Dove Body wash. 2 × 710 mL + 354 mL. Price before discount: $14.99. $3 OFF Ultra Downy Fabric softener. 197 washloads. Price before discount: $15.99. $415 OFF Kirkland Signature Tencel unscented baby wipes. pack of 900. $2 OFF Frito-Lay Munchies snack mix. 1.1 kg. Price before discount: $6.99. $2 OFF Danone Silhouette yogurt. 24 × 100 g. Price before discount: $6.99. $4 OFF Systane Ultra Eye drops. 3 × 10 mL. Price before discount: $18.99. $10 OFF Kirkland Signature Protective underwear. men’s or women’s. various sizes. Price before discount: $34.99. $3 OFF Paper Magic All occasions greeting cards. box of 30. Price before discount: $15.99. $2 OFF Fontaine Santé Hummus. 2 × 565 g. Price before discount: $6.99. $13.99 EACH. Tylenol Complete Day and night relief. 60 caplets. A, B, E, X. $11.99 EACH. Zantac 150 Maximum-strength heartburn prevention and relief. 150 mg, 50 tablets. $4.99 EACH. Kirkland Signature Extra-strength acetaminophen. 500 mg. 2 × 350 tablets. $23.99 EACH. Robax Platinum Back pain reliever. 82 caplets. $10.99 EACH. Advil Junior Ibuprofen. 100 mg. 60 chewable tablets. $6.99 EACH. Kirkland Signature Ibuprofen. 200 mg. 250 liquid capsules. 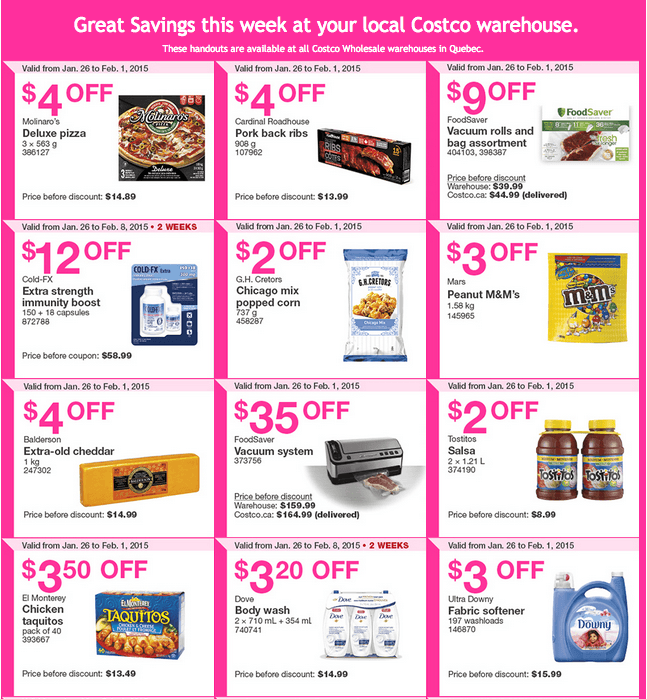 Click here to view all Costco Canada instant weekly handouts flyers. Good morning! 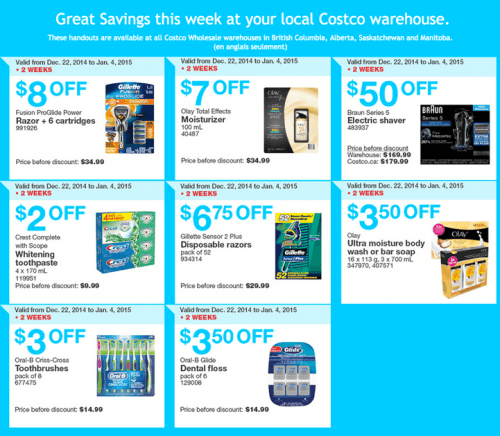 Costco Canada has released now the new eastern weekly instant discount handouts! These handouts are available at all Costco wholesale warehouses in Ontario and Atlantic provinces. These Costco Canada eastern instant flyers are valid from today, Monday, January 26 until Sunday, February 1, 2015, some are valid for 2 weeks until Sunday, February 8, 2015. Only Costco members in good standing may use these instant savings handouts and Costco discount will be automatically added when you purchase any of these items. $4 OFF Balderson Extra-old cheddar. 1 kg.. Price before discount: $14.99. $3.20 OFF Dove Body wash. 2 × 710 mL + 354 mL. Price before discount: $14.99. $2 OFF G.H. Cretors Chicago mix popped corn. 737g. $7 OFF Kirkland Signature Coenzyme Q10. 100 mg. 300 softgels. Price before discount: $29.99. $4.50 OFF Caltrate Plus Calcium carbonate. 160 tablets. Price before discount: $19.99. $4 OFF Tylenol Complete Day and night relief. 60 caplets. Price before discount: $17.99. 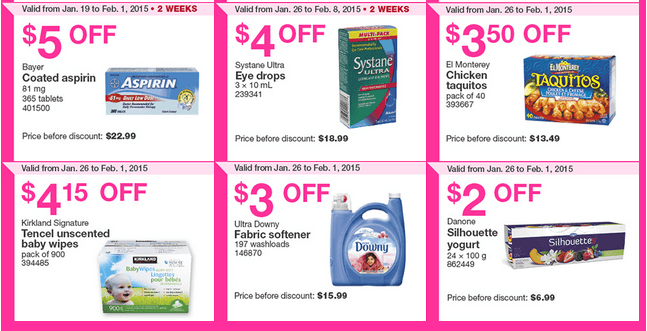 $5.50 OFF Bayer Aleve. 220 mg. 250 caplets. Price before discount: $21.99. $4.50 OFF Webber naturals Super Sleep. 90 soft melt tablets. Price before discount: $16.99. $5 OFF Webber Naturals All Greens with super berries drink powder. 450 g. Price before discount: $24.99. 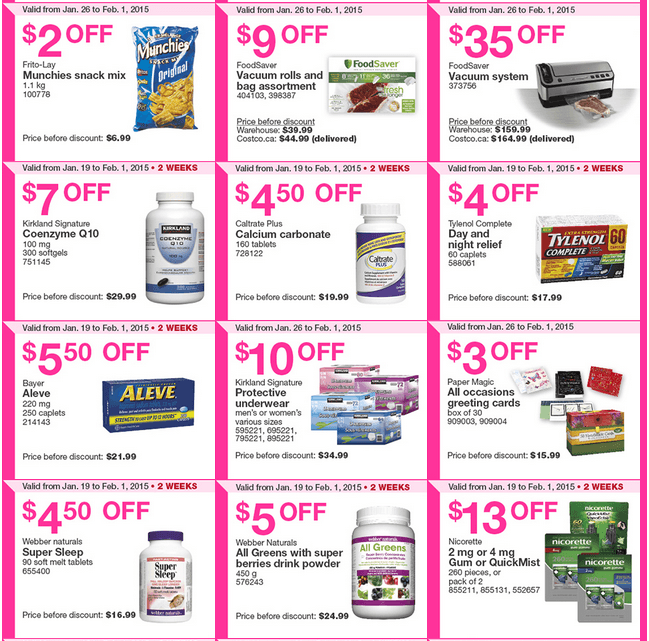 $13 OFF Nicorette 2 mg or 4 mg Gum or QuickMist. 260 pieces, or pack of 2. $5 OFF Bayer Coated aspirin. 81 mg. 365 tablets. Price before discount: $22.99. $3.50 OFF El Monterey Chicken taquitos. pack of 40. Price before discount: $13.49. $4.15 OFF Kirkland Signature Tencel unscented baby wipes. pack of 900. $2 OFF Danone Silhouette yogurt. 24 × 100 g. 862449. Price before discount: $6.99. Here’re the new western weekly instant savings handouts flyers at all Costco Wholesale warehouses in British Columbia, Alberta, Saskatchewan and Manitoba. 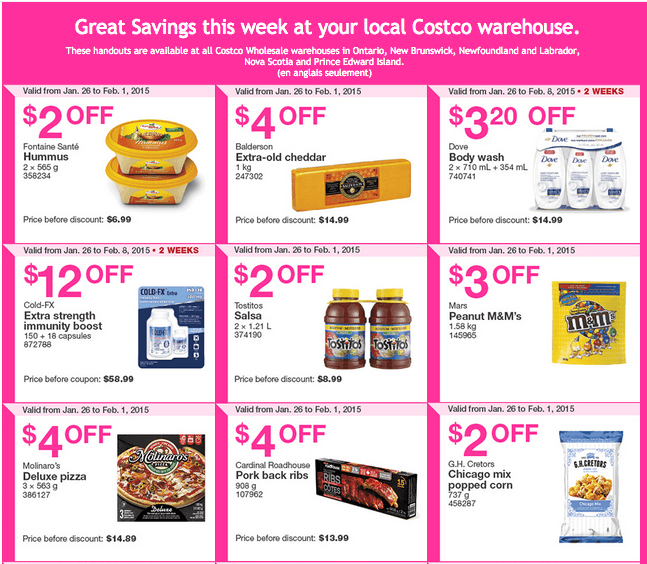 These Costco western instant savings handouts are valid in-stores for two weeks, from today, Monday, December 22, 2014 until Sunday, January 4, 2015. Only Costco members may use these instant savings handouts coupons. Click here to view all Costco Canada instant hand­outs fly­ers. Costco Canada Black Friday 2014 Event Sale: Save on Exclusive Online Offers! Costco Canada has launched their Black Friday Canada 2014 Online Exclusive Sales Event! Shop at Costco Canada Online and enjoy hot sales and deals while supplies last on tons of categories of items! Below you will find the absolute perfect Christmas gifts to finish your Christmas shopping during this Costco Canada Black Friday Canada 2014 promotion. Plus, you will earn 3 Aeroplan Miles for every dollar spend online on orders placed on Costco.ca from November 25th through to December 1st, 2014 as part of their Black Friday Canada 2014 offer! Click here to shop at Costco Canada Online and enjoy their Black Friday Canada 2014 sales and deals. Lowe’s Canada has a new good offer! This Lowe’s offer is available online and in your selected store through special order express, store pick-up or home delivery. Lowe’s Canada has FREE shipping on this item as well. Click here to get Lowe’s Canada online offer. Also, click here to get all Lowe’s canada online offers.